They say that customer experience (CX) is the new marketing. People will tell their friends about their experience with your agency, and social media makes it easy to broadcast whether the experience was easy and enjoyable, or terrible. 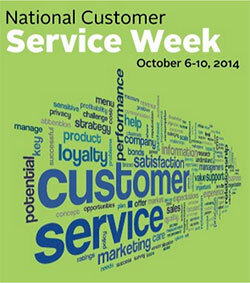 In 1992, Congress proclaimed the first full week in October as National Customer Service Week, and as we close out Customer Service Week 2014, here’s a recap of some great customer-service-related articles published on DigitalGov.gov over the past several months. Check them out, and maybe you’ll be inspired to tackle some customer service improvements of your own! User Experience (UX) vs. Customer Experience (CX): What’s the Dif?—The subtle, but important difference: User Experience (UX) deals with people interacting with your product and the experience they receive from that interaction. Customer Experience (CX), in contrast, encompasses all the interactions a person has with your brand. Government CX: Where Do You Find the Right Foundational Metrics?—Begin with your agency’s strategic plan. What gets measured, gets managed. Customer Experience Video Blog—Stephanie Thum, Export-Import Bank, gives us an introduction to Customer Experience. The Importance of Cross-Channel Customer Service—DigitalGov Summit Recap—Experts from across government came together on a panel at the DigitalGov Summit in May 2014 to share what customer service means to them and their organization, and specific ways they leverage it. 3 Steps to Keep Customers Happy During Times of Change—It’s all about communication. Start internally, build a communications bridge, and check your external communication points. Delivering a Customer-Focused Government Through Smarter IT—Programs like 18F and the U.S. Digital Service can help agencies use technology more effectively to improve service delivery. What Do People Think of Your Content? Ask Your Contact Center!—Knowledgeable contact center agents talk to your customers every day, and can help you identify problems with online content. Don’t make people call your contact center because they were not able to complete a task online. Need Help Responding to Facebook & Twitter Questions? Use Your Contact Center Customer Service Experts—Case study from the National Cancer Institute on using contact center staff to respond to customers via social channels. Redesigning with Customer Feedback: Child Support Enforcement Usability Case Study—After an agency-wide redesign to apply a common “look and feel” to program websites, customers of the federal Office of Child Support Enforcement at the Administration for Children and Families had trouble finding information. A customer focus group helped the agency website get back on track. Customer Satisfaction: Innovating with Lack of Resources—Case study from the City of Philadelphia to find innovative solutions to effectively collect, and manage, accurate and real-time customer experience responses. Government CX: Finding the Metrics that Matter—How the Export-Import Bank identified which CX metrics to track, to meet their business goals. Our office at GSA has been working for the past year to institutionalize a customer-centric culture. The following articles recap our journey so far. Kicking Off Our Customer Experience Program—The vision is simple: Deliver a world-class experience to the public when accessing government information and services—anytime, anywhere, through the delivery channel they choose. The reality is both challenging and critical to our success. How to Create a Customer Experience Index (CXi)—A CXi is a common yardstick to measure outcomes and drive behavior change to improve service delivery. The Impact of Culture on Customer Experience—Organizational culture is one of the most difficult things to change, but without a culture that embraces customer experience, you can’t deliver great customer experience. What’s Your Strategy? Operational Excellence, Product Leadership or Customer Intimacy?—What unique value do you bring to the marketplace and your customers? Be clear about strategic priorities to deliver the best products and services. What is your agency doing to improve the experience you deliver to your customers? If you have a story to share, let us know!